With the latest wired and wireless microphones, manufacturers are addressing new trends in meeting room design. Offering improved voice clarity, while also increasing install flexibility and expanding coverage area, these products are built to suit an array of conference and huddle room applications. 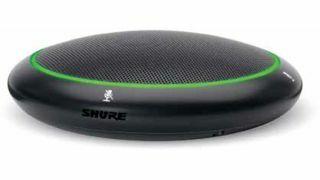 The Microflex Advance MXA310 Table Array microphone from Shure aims to provide consistent voice clarity for everyone in a meeting, and it is particularly suited to huddle spaces and meeting rooms. Designed for applications where the number of attendees varies and an uncluttered table is preferred, one table array captures up to six people in discrete listening areas. The new toroid polar pattern rejects overhead noise from HVAC, projector fans, and other sources, and the pattern optimizes voice clarity and volume. Microflex Advance improves communication with technology that enhances speech intelligibility and delivers consistent sound clarity for AV conferencing. The MXA310 is ideal for corporate standardization as it can be configured for any room or table setup and requires only a single data cable to transmit audio signals, power (PoE), control, and network connection. The MXA310 Table Array microphone is less intrusive than traditional microphones, as one microphone covers a group of up to six people in four zones on a Dante network over ethernet. The coverage geometry can be set for up to four areas in 15-degree increments, and polar patterns can be specified for each configuration including cardioid, supercardioid, hypercardioid, omnidirectional, bi-directional, and a patent-pending toroid pattern. The Elite wired microphones from Revolabs are a line of tabletop and gooseneck microphones for use with nearly any installed audio solution. They can be used separately or in tandem with wireless microphones to increase the maximum number of microphones available in one space. The microphones can also be integrated with post-processing and mixing appliances to support unified communications and other applications requiring audio support. The range includes directional and omnidirectional tabletop and gooseneck microphones with or without on-microphone mute option and status indicator light. It also includes audio equalization, optimized for speech to increase the success of installations. Additionally, the administrator has mute control at the processor and optional mute button with status indicator light for individual mute control at the mic. Revolabs also claims the microphones set new standards for signal-to-noise ratio and the supported frequency range. The tabletop, wearable, and gooseneck can be mixed and matched, and they are available in three colors: black, white, and brushed nickel. Elite wired mics are particularly suited to environments in which wired and wireless microphones are used in tandem, increasing the maximum number of microphones available in a space and combining wireless flexibility and wired security. The IM Series puts the focus on high intelligibility, and the polar pattern delivers the same clarity regardless of where a speaker is in relation to the microphone. This polar pattern also means that, according to Earthworks, the coverage area of one microphone from the series is the equivalent of three competitive mics, which also means less DSP and fewer cables. The microphones have been designed with aesthetics in mind to be unobtrusive in conferencing rooms. The technology within the microphones includes a new approach to the design of the models, with extended high-frequency response, fast impulse response, and diaphragm settling time. These technologies enable the mics to be far more accurate, with much higher intelligibility and no significant high-frequency losses at the sides of the microphone. In addition, the microphone is DSP agnostic, so the integrator is not limited in what processor they are able to use. This gives them more freedom to design the best overall system for their client. The ATND971 is said to be the world’s first wired Dante-enabled microphone, bridging the gap between audio and IT, transmitting both audio and control data over Dante. This offers the installer the ability to integrate audio with overall system control via Cat-5e/Cat-6 cable over a standard IP network, making the task of setting up a network much simpler. A simple ethernet connection allows the ATND971 to communicate across a network of Dante-enabled devices and the microphone’s programmable user switch offers control of any of those devices at the push of a button. The ATND971 is suited to boardroom and meeting environments and can take control of functions such as video camera pan and tilt, and even room lighting presets. Powered by network PoE, it also features Audio-Technica’s UniGuard RFI-shielding technology and UniSteep low-cut filter for high-quality audio from source. Advantages this model has over analog alternatives, thanks to its Dante compatibility, include low latency, ease of configuration, as well as the minimizing of cable runs. Additionally, the fact that Dante’s digital signal isn’t degraded by electromagnetic interference or high-frequency attenuation also makes it suited to all areas of pro audio, from broadcast and live sound to AV. The PC Desktop from the PolarChoice series is a freestanding tabletop microphone with dual-section gooseneck. Available with a 5-, 12-, or 18-inch gooseneck, the PC Desktop also includes easy switching between four polar patterns: omni, cardioid, super-cardioid, and hyper-cardioid. It also utilizes Electro-Voice’s RF Shield technology, which maximizes protection from destructive RF and GSM interference. Additionally, PolarChoice technology delivers high-quality installed sound convenience, reliability, and performance. Designed for versatility and error-free setup, the PC Desktop microphone incorporates four switchable polar patterns strategically designed for installation-specific applications. Selection and deployment is as easy as choosing the best physical design for the situation and setting the polar pattern switch for the appropriate coverage. Should installation conditions change, a switch of the pattern is all it takes to meet the new requirements. The Audix M3 tri-element microphone provides smooth, evenly dispersed coverage with its three-phase coherent hyper-cardioid capsules optimized for human speech. The M3 also offers a high sensitivity rating and what is claimed to be the lowest self-noise of any tri-element microphone, resulting in a dynamic range and high signal-to-noise ratio. Microphone height adjustability is accomplished by providing a standard 1.2m cable with adjustable ceiling mount, and Audix can also supply custom cable lengths when ceiling heights are above 3.5m. The silicone-jacketed mic cable provides a kink-free hang from ceiling to mic, and Audix has a plenum-rated junction box for installation above the ceiling. The M3 answers a growing trend of reconfigurable seating in conference rooms, where more fluid meetings are taking place and tables and chairs may need to be moved. Traditional hard-wired table mics can be less effective in this environment and high-performing ceiling mics, such as the M3, are suited to these environments and applications. In addition to its natural sound and small form factor, the 360-degree coverage is very forgiving when seated or standing positions can change. ISE 2017 will feature an Audio Solutions Theatre on the exhibition floor with numerous educational opportunities focusing on audio, including equipping meeting rooms with the best quality sound. On February 10, from 11:30 a.m. to noon, Stuart Stephens, sales and project engineer, Shure U.K., will present on “The Impact of Sound on Business.” The session will educate the audience about the benefits of good meeting sound and its effect on productivity and collaboration, client perceptions, and the health and wellbeing of staff. It will arm the audience with the information, technologies, and concepts needed to provide a compelling argument for the benefits of enhanced conferencing sound to their clients and highlight the competitive business advantages of high quality conferencing sound.